Saturday 28th and Sunday 29th March saw the REDucation training workshop arrive in London at the Met Film School in Ealing Studios West London. I've used a Red One but have yet to work on a shoot where I can get my hands dirty with the newer cameras they manufacture (Epic-X, Scarlet, Dragon and now Weapon). When I was asked to attend the course and write up the experience by Kit Plus magazine I naturally jumped at the opportunity. The course is run over two days in the UK and so there is a lot of information to pack into the 18 hours of guided tuition, lead by John Marchant, Dado Valentic and Steve Johnson. Sam Measure was present from the RED Bombsquad at Pinewood and assisted the groups in setting up of cameras and answering technical questions. Jon Theobald and several recent Met Film School graduates were also assisting the groups once we got started with the cameras. The course was neatly broken down into camera setup and operation, shooting, workflow, some colour theory and post-production overviews. It began by covering operations from basic to advanced, the user interface (the menu often puts people off), shooting great images, testing the camera, tips and tricks, inside knowledge and info, 'touch every button' and camera builds. As the participants of the course were all introduced to one another in the first half hour it was clear that there was a wide range of experience, professions and interest in the room. From high end stills photographers, their crew, facility company staff, filmmakers, RED owners, resellers, small production companies, to the likes of me - freelance operators, DoPs and directors from the world of Music Video, Fashion, Documentary, Independent Film, Broadcast and Corporate production. From an operators or self shooters perspective it was useful to go through some of the essential maintenance procedures such as cleaning the sensor, changing the OLPF (Optical Low Pass Filter) and also the most base level of setup - charging batteries, navigating the first level of the menu and optimising the fan settings and formatting your media. One key nugget of information here, for example, was to allow the camera to warm up for about 10-15 minutes before you begin shooting with it - and also before you calibrate the black shading of the camera. This is something that I would always do with any rental camera since you have no way of knowing how recently this was done with any hire. The best thing about RED is the RAW workflow, but this workflow demands a specific approach and understanding of how to get the most out of it. It really depends on what you are producing for and how much time and consequently budget you have in post to deal with your images. Second to that one cannot fail to mention the overall build quality - the cameras are not low cost but the high quality manufacture of the modular system and constituent parts - the 'ecosystem' is considerable. 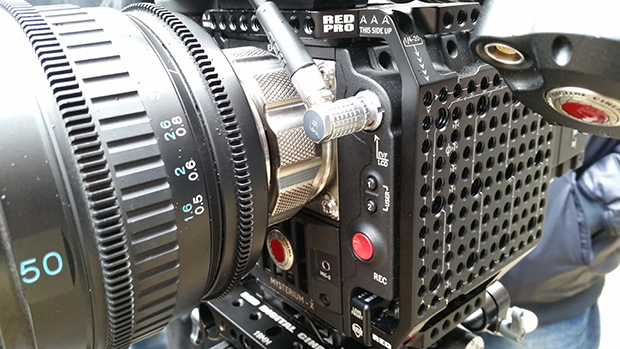 The RED One is the camera that arguably ignited the Digital Cinema revolution and really made world class experienced directors and cinematographers believe that Digital Cinema cameras would and could soon offer greater latitude and dynamic range than traditional film stock. Now with many of the digital cameras out there we are at a point where Digital Cinema technology far exceeds the visual capability of what was previously achievable on film. But what is so different and special about RED? For those who are converted to it - it is like a religion, something for them to shout from the rooftops and evangelise over. I was keen to find out. More light = less noise and therefore better images. It is always far easier in post to scale information back a little than to bring up shadows that are underexposed - this will only ever introduce unwanted noise. Where RED comes into its own is the control in post over the ISO and especially FLUT. FLUT enables the DiT or Editor / Colourist to very subtly change the exposure of an image in a non-incremental way - unlike ISO, which happens incrementally. This is extremely useful as you can overexpose by half a stop or more when shooting and then bring it back to a correctly exposed level in post or at first light grade. That way making sure we have the highlights texture and we do not have any area of the image with too little light that we can't adjust. 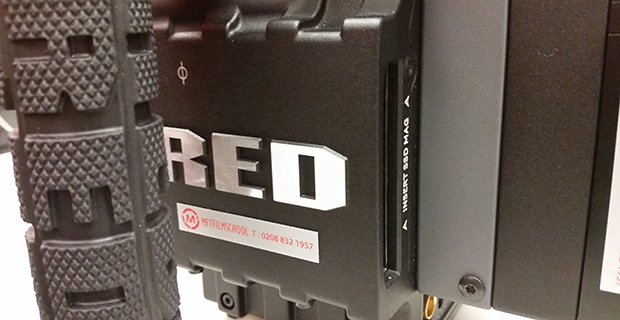 This is by far and away one of the most distinctive and advantageous points of the RED workflow. The exposure dynamics are extremely forgiving. Perhaps one of the cameras strongest points is also its weakest - There could be an over-reliance on this latitude by over zealous operators, similarly I don't think that shooting at a high resolution simply so you can 'reframe in post' is a good option - the DoP has hopefully placed a great deal of attention to framing to get things right first time. But, that's just my opinion and a whole different conversation - back to the course. In the afternoon of the first day we spent a good hour and a half shooting camera tests. We looked at compression ratio settings and experimented with the various available resolutions, frame rates and ratios. Both the modularity / form of the cameras and the advantages of RAW recording and Log colour space are key selling points that other manufacturers have certainly reacted to (including Arri). The ability to set in camera the compression ratio used as well as load in pre-made LUTs (and soon 3DLUTs) allows exceptional flexibility in the way that you can set the camera up depending on your final delivery and platform. The extremely talented and charismatic Dado Valentic headed up the second day, Dado clearly had passion and emotion for his work and it rubbed off on the participants whom all needed the energy after loosing an hours sleep to the British Summertime clock change. Dado covered lots of ground: colour science and theory, grading, DiT, workflow overviews, DaVinci Resolve and the RED Cine-X software. Now this is a lot to fit into a day of course you could spend weeks, months and certainly years learning these subjects, but what Dado managed to do was to present complex technical, mathematical and artistic information in a way that was easy for everyone in the room to understand. Dado took footage the groups had shot the previous day in the camera tests and took us through the Cine-X software and later into Resolve, having someone as talented as Dado really demonstrated how the flexibility of the system can be maximised to achieve any look you want at the end of production. I was keen to learn the main workflows for handling the files and post with the .r3d files. These were clearly communicated to a group of various abilities and experience. For me the majority of the workflow advice seemed in line with what I do with other systems - but for sure if you are going to shoot on RED or any other RAW system then you better plan your post and live shooting workflow and monitoring before you arrive on set. With the latest updates to Premiere Pro CC and reduction in price of storage it's possible to stay with the original .r3d files all the way through the pipeline from camera > edit > grade and this is truly exciting - though it will require the latest in hardware to make the process a smooth one. I would definitely recommend the course for anyone who is interested in working with RED on either the camera or post side or indeed both. I found it very clearly, professionally delivered and packed full of information, tips and first hand knowledge that will be applicable straight away shooting with any of RED's cameras. The way in which learners were supported was great, as was the provision of equipment; the group sizes were not too big which meant hands on for everyone. 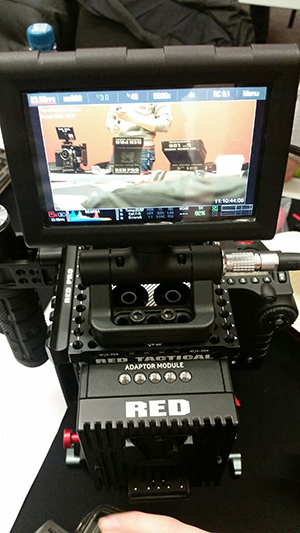 If you are going to work with RED and want a solid overview then this seems like the logical place to start. Finally, if you're thinking of buying you receive a discount at the RED store for a week after the course and if that's not enough to convince you, you'll get a very cool large mouse mat and a 16GB memory stick with the course literature and some of John Marchant's RED reel test shots for colour grading - the ideal weapon with which to practice. Arm yourselves and give RED a go.